In a perfect world, DC’s New 52 experiment would begin with a blank slate, and the market would decide which of the 52 new titles would continue, and which would end up getting canceled. It wouldn’t help to have “Batman” or “Justice League” in the book’s title. It would just be story against story, may the best books survive. Of course, it’s not going to work like that. All of the comfortable books than play to the already popular properties will thrive, a few surprises will squeak through, and everything else will get shot in the back of the head as soon as it’s clear they’re going nowhere. Because I’d like to support DC for taking chances, and know for a fact that nonsuperhero comics can be a successful part of the DC mix (as they were for decades), I’m strongly drawn to the new titles among the New 52 that offer something genuinely different than standard superhero fare. There’s a lot of this type of thing in the weeks to come, and to some extent this week’s Animal Man and Swamp Thing touch on a sort of horror vibe (albeit with superheroes), but this week only one title among the New 52 tries to break the mold and offer something genuinely different. 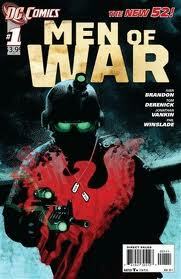 Men of War stands out from the others not just because it is a war-themed comic featuring real soldiers in modern (read: Middle Eastern) conflicts, but also because, with two stories in a single issue, it’s the closest thing to an anthology book that the relaunch has offered so far. The first story, “Joseph Rock,” (by Brandon and Derenick) features seasoned infantryman Corporal Joe Rock as he joins a new squad led by the ambitious Sargeant Torisi. Torisi leads his team on a parachute mission into enemy territory, but just as they jump out of the plane, an unseen metahuman flies right through their target, blowing it up in a giant explosion. The rest of the story is a frantic run through the streets of enemy territory as the superhuman (we see only his motion lines and the aftermath of his passing) trashes the place with no regard to friend or foe. At one point Torisi even says he suspects that the squad and the superhuman are on the same side. It’s difficult for the reader (and Torisi’s squad) to tell exactly what is going on, but it appears that another metahuman emerges from the shadow of the first, and the battle intensifies. Torisi is slain in a resulting explosion, and in the final panel he field-promotes Joe Rock, giving us (and the New DCU) a brand new, modern version of Sargeant Rock. Joe is the grandson of the original World War 2 character, one of the most famous in DC’s stable and in comics in general, and certainly one of the most famous (and valuable) war comic heroes in history. I wasn’t expecting this twist, having not looked closely at the badly photoshopped-in-after-the-fact dogtags reading “ROCK” on the front cover), so I was mostly thrilled with the development. I think I would have preferred that superheroes not be a part of this book at all, but I like the way that they were handled, and so long as Men of War maintains the “regular-human’s-eye view” of life and conflict in a world with superhumans, I’m ok with it. Both art and dialogue were up to the task, here, and it felt like this story packed more into 18 pages than many of this week’s other titles managed in 22. I’m glad to see a new Sargeant Rock looks to be the ongoing lead feature of this comic, and am interested to see where the story goes next. Vankin and Winslade’s back-up feature (it’s not quite fair to call it the “second story,” as it fills only 8 pages and is merely part 1 of 3), “Navy Seals: Human Shields,” concerns a squad of four Navy Seals operating behind enemy lines in a country they aren’t legally allowed to be in. Injuries quickly take down two members of the team, and it’s up to specialists Ice and Tracker to take out the gunman firing at their wounded pals before the rescue copter arrives. They’re certain the insurgents have an RPG they’ll use to blow up the copter, triggering an uncomfortable political incident. Ice and Tracker, through action and dialogue, manage to convey a better hawk/dove dichotomy than the actual characters Hawk and Dove managed in their entire issue this week, and at the end of the story the two find themselves in a showdown with a gun-wielding insurgent, with a young child in the crossfire. It’s a fun story with good dialogue and decent art, but it doesn’t quite reach the level of the main feature. Still, it’s great to have more than one story in this comic, which very nearly justifies the extra dollar in its asking price. I do wonder, though, if DC didn’t miss an opportunity with the title. For a relaunch that has otherwise shown great attention to diversity, and with women increasingly playing an important role in our military, I have to wonder if a more inclusive title would have been a bit more timely. DC published war comics for decades, and must have had several different legacy titles available. With good art, strong storytelling, and a genuine attempt at something different, Men of War is a definite keeper, and I’m eager to see what happens next.